Another Beautiful Day in Paradise. We had beautiful clear blue skies in the 60's and very little wind for our skate/bicycle. There were a few damp spots but what a great day. 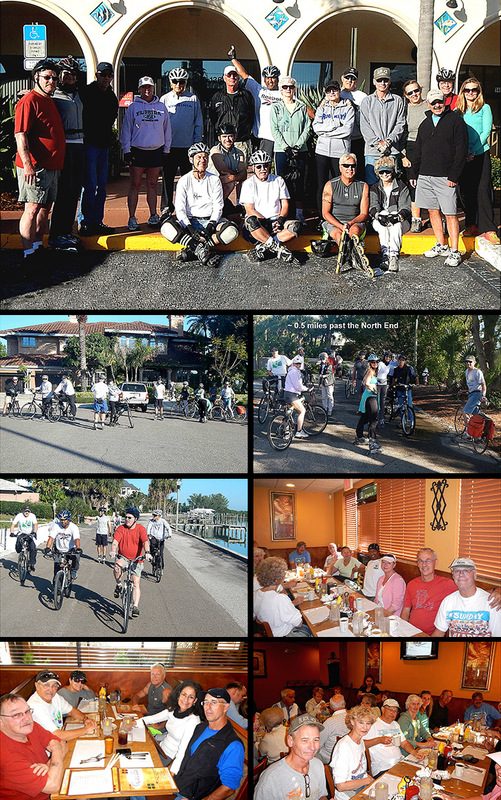 Blader/Bicyclers Tim K, Theressa & Chris V, Laura P, Steve G, Roy H, Rick the Breeze, Carol J, Ginnie S & Rick P, Bill S, Sheila, Rob H, Bruce M, Kim F, Jeff B, Mike F, Dee T, Jim H and Diane S came. Welcome all. It was good to see Tim, Bill, Diane and Sheila again. Welcome back. We did our usual Clearwater Beach run but the gate across the road at the very North end was open. It did have a sign saying "Only owners may enter". Well we all owned something so we headed North through the gate for another half mile or so looking at the beautiful homes. The rest of the run was uneventful but fun and pleasurable. We had 5 bladers and 15 bicyclers. One group did 12.7 miles and the other did 11.5 miles. Since Dec. 21 Bill H, Rick the Breeze, Carol J, Chuck H, Jeff & Darlene B, Dee and Sam T, Janice H, Laura P, Linda S, Mike M, Roy H and Steve G have renewed there Sponsorships for 2014. Thanks all for your website support. We Brunched at the Georgie Boy restaurant as planned. We got right in and seated quickly in spite of me telling them we only had 15 people coming when we ended up with 19. The service was good considering our big group and the coffee flowed freely. One table rated their Brunch a 9.5 and the other a 9.7. We'll give them a 9.6.